Saturday, January 27th @ 7:00PM – Only $23.95 per seat! Seats are limited. Purchase Your Tickets Today! The Workin’ Men This concert immortalizes two of country music`s true outlaws and friends to the working class. Haggard and Paycheck recorded over 136 albums over 100 charted hits and 40+ number ones. Haggard was a two time Grammy winner including the lifetime achievement award. Paycheck was Grammy nominated for song of the year for ‘Take This Job and Shove It’ as well as a movie of the same name. Johnny Lovett (Merle Haggard) and Ace Crye(Johnny Paycheck) perform the songs that made Haggard and Paycheck famous. You’ll hear hits such as From Muskogee, Workin’ Man Blues, Momma Tried, Take This Job and Shove It, Slide Off Your Satin Sheets, and Don’t Take her She’s All I Got. From Dance Halls to time in Prison Haggard and Paycheck lived the life they wrote about. 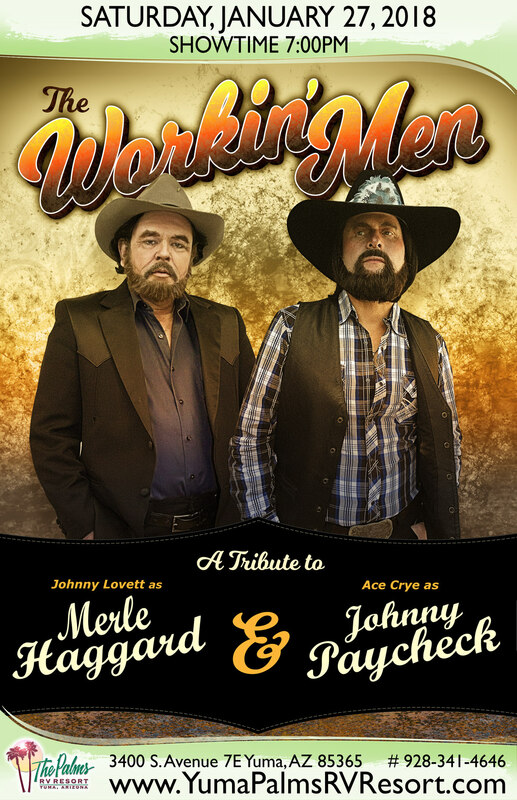 Re-live the true hard workin’ outlaw country music with Lovett and Crye as Haggard and Paycheck in ‘The Workin’ Men’. Click Here to Purchase Your Tickets Online Right Now! -OR- Contact Us!